how simple it is to make coleslaw. I always see it at the counter and just assume it's a whole six day operation where only specially trained deli owners knew the process and used special tools I've never even heard of. Seriously, to me, anything behind a class counter seems like a trained prodigy child must have made it after years of being taught by his father whose father passed the recipe on to him. A lot goes through my mind while I'm ordering a sandwich. So I dragged this cabbage all the way from the farm back to the city. 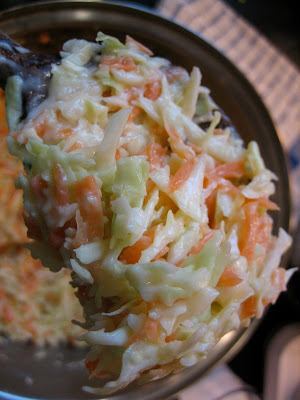 It was pretty surprising to find out how much coleslaw I could get from one cabbage and a few carrots (also seasonal). Well with a few ridiculously simple steps, my at-home sandwich eating was changed forever. Gotta love the farm. 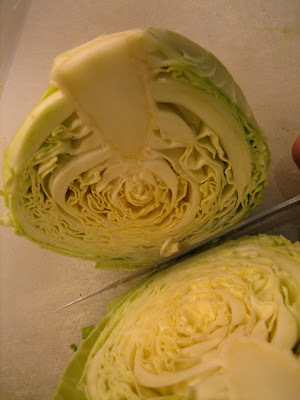 Anyway, after you unclog your sink wash your cabbage, you want to cut it into a few smaller pieces that can fit in a food processor and shred them. Shred 3 carrots or as many as you like depending on what cabbage to carrot ratio you are looking for (I say go big or go home) and add them to a large bowl with the shredded cabbage. In a separate bowl add 2 tablespoons of vinegar, I used rice vinegar but any flavor will do, and 2 tablespoons of oil, I used vegetable oil because I didn't want to affect the taste too much my first time by adding an olive oil although I will probably try this at some point. 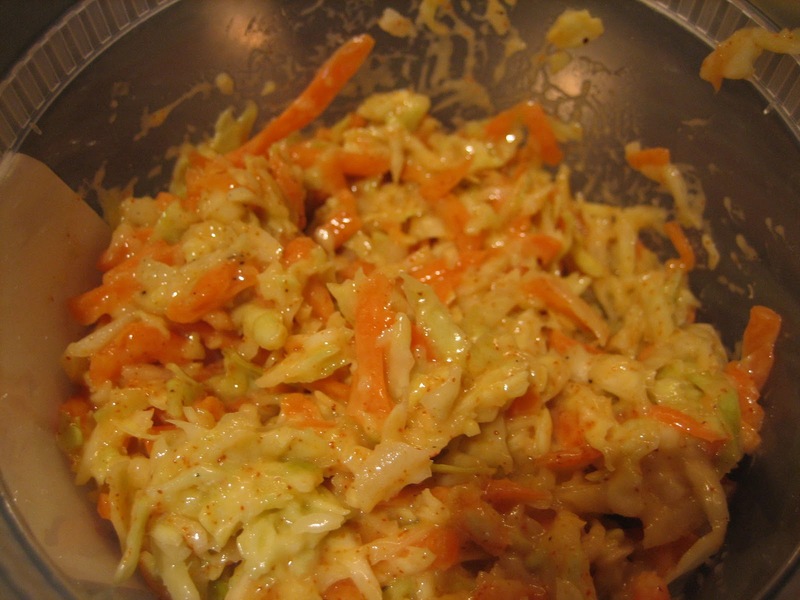 Pour the liquid ingredients into the bowl with the carrot and cabbage and Stir It Up. That looks damn good, but for all you real flavor lovers out there, the best part is saved for last. Come on, that's straight Katz' Deli style right there. Once you've separated one container for the non-spicy lovers, make sure to sprinkle on some ground red cayenne pepper and mix it in well to add a nice little kick. It's really amazing, I didn't even make it to my sandwich before it was all gone. Simple, easy, tasty and seasonal, what more could you ask for? Now go forth and make some sandwiches and don't forget to put some homemade coleslaw in there. 1. Shred cabbage and carrots and place in a large bowl. 2. Thoroughly mix mayonnaise, vinegar, oil and salt. 3. 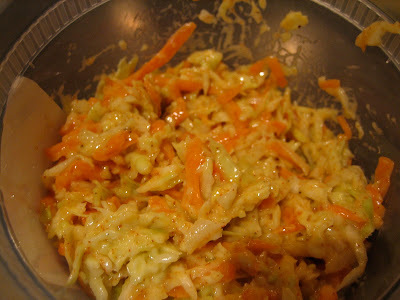 Add liquid ingredients to shredded carrot and cabbage bowl. 4. Mix together until liquid ingredients are evenly distributed. 5. For spicy coleslaw, add ground red cayenne pepper to taste. Obviously add more mayo or vinegar depending on your needs. hey J, nice looking slaw, love the rice wine vin. addition. I try apple cider vinegar or really any good vinegar you think would work. And sour cream for tang instead of mayo , or half and half.... just a thought. like the idea of spice in there!! also red cabbage for color to made it really pretty. Thanks for writing in, I love the idea of using a sweeter vinegar instead of adding unneeded refined sugar. Can't wait to try it out! Thanks for the tips...Always love getting some advice from a pro.